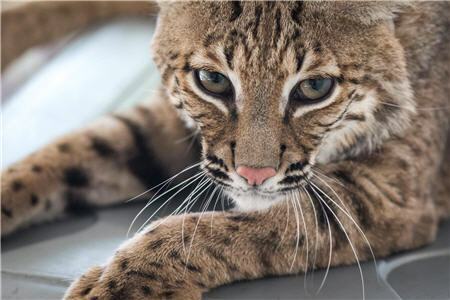 Runa was plucked from the wild when a group of bobcat kittens was uncovered by some people passing by. While the kittens took off running, they were all caught and taken in by several different people. After Runa was raised on someone’s couch for a year, the owner realized that what she had done was not really in Runa’s best interest. She contacted the Sea Life conservation facility, who in turn contacted us. She had been raised with two domestic cats and a dog, so this made her introduction to Jezebel and Gideon go smoothly. 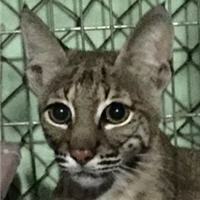 Runa doesn’t really like attention from the staff, but she does have her favorite people and she loves snuggling and playing with her bobcat roommates.